Environmental and economic sustainability is becoming more & more vital to successful companies. Helping your employees help the world through employee based social programs & Corporate Social Responsibility has become a new standard that sets many successful businesses apart from their competitors. Corporate Social Responsibility (CSR) policies provide many advantages including tax benefits, positive PR, and brand identity, and increased employee morale and retention. We help your business create positive social responsibility outcomes. Our CSR Programs help your employees work with nonprofits all over the world, and by doing so, they change their lives and the lives of others. Does your company have a positive public image as a contributor to the world? Do your employees truly believe in your organization and the impact it is making? Does the future of your business depend on the future of the planet? Your employees would love to use their careers to create a positive impact, but too often obligations with work, family and finances get in the way. 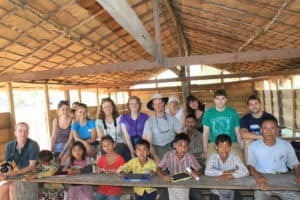 Destination:Earth provides a unique opportunity for employees to participate with their employer in a great cause while having the experience of a lifetime! Together, we can take on the challenge of corporate social responsibility by creating a platform through which you and your employees can make a large impact on communities around the world! The potentials are endless. We can work directly with you and tailor an positive-impact adventure to meet your specific needs. Our upcoming trips are a great opportunity to open your employee’s eyes to other cultures and different needs of groups around the world. This fresh perspective often translates to finding new solutions in the workplace and increased productivity in a way a normal vacation could never do. Your staff will not only get an enjoyable break from the day to day, but they will come back with a fresh perspective that a week at the beach simply cannot do, ready to take on that next challenge! A company’s greatest asset is their people. Allowing the world to benefit from that asset is priceless. Employee-driven philanthropy connects people to what matters most. When organizations facilitate their employees in making a positive difference, employee’s job satisfaction rises, attrition rates lower, and employee morale improves. Brands that take positive action for humanitarian, environmental causes are seen as more desirable by the general public. Brands that engage in CSR as generally seen by both the general public and employees as being more trustworthy. 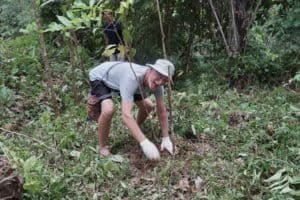 Our Eco-Voluntourism excursions will benefit your business, your employees, and the world we all share.